Pie In A Cake! | DidjaEat? If you read this food blog in any kind of regular-ness, you’ll know that my family likes to not only eat a lot, but we also like to try new and ridiculous things. You only live once, right? So, as I drove to Jeff and Tara’s for the yearly watching of Wrestlemania (don’t judge), I had no idea what Lorrie had in store for dessert. Normally, for any kind of gathering such as this (or Sunday Funday, which I think is another post), I bring a Carvel ice cream sheet cake. I say it’s for the kids but really, any excuse to eat ice cream cake is just fine with me. Arbor Day? Survived Sunday at Target? Still drunk from the night before? I rarely eat dessert so I justify it that way. 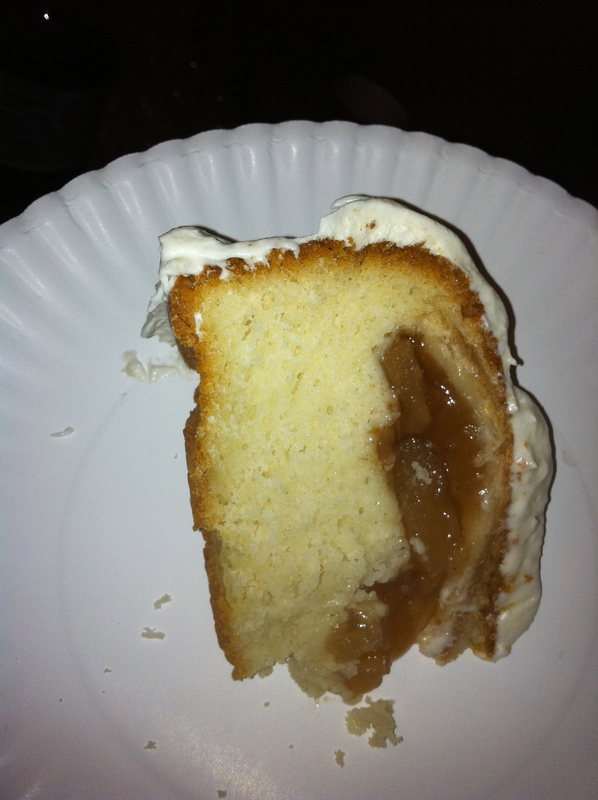 Anywho, once I decompressed from almost getting slammed into by a Snooki lookalike whilst driving around Oxford Circle, Lorrie told me what she made….a Pie..In A..Cake! Now, we live in a pretty great country (falling apart or not, you really can’t beat it. Shut up, Canada.) and I think this piece of American ingenuity proves it. Lorrie told me how she came up with the idea, something about seeing it on tv and then googling it and then…I sort of blacked out. Overstimulation? Probably. I’m still wrapping my mind around it. Here is the first pic! Reverse Angle Pie In A Cake! Closeup Pie In A Cake! Piece Of Pie In A Cake! 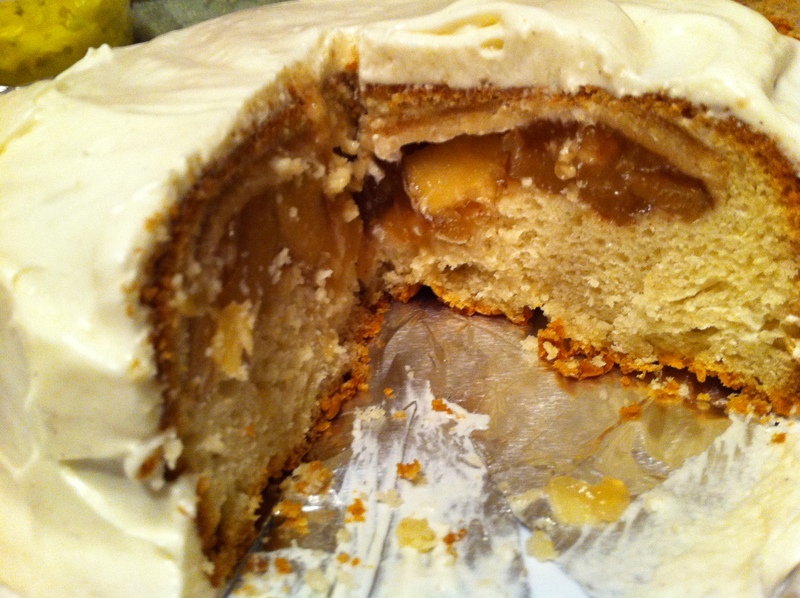 Now, Lorrie made this cake with plain ol’ vanilla cake & frosting and an apple pie. 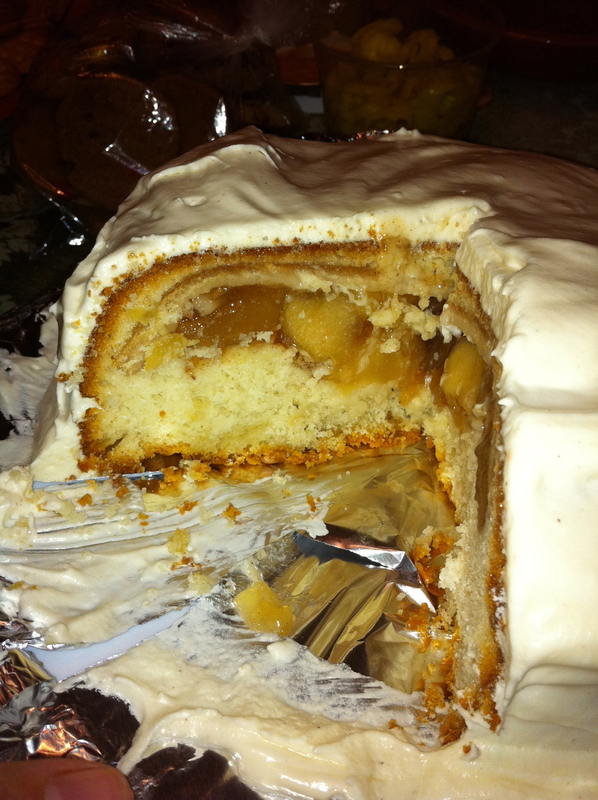 It was really interesting and tasted like a Jewish apple cake. So, it got us thinking of different flavor combos. You could do a chocolate cake with a cherry pie in the middle. Or a pumpkin pie in a spice cake! Or a blueberry pie in a red velvet cake with cream cheese frosting for the 4th of July! The possibilities really are endless, and this was the first time she made it so there are ways to tweak how it was made. Maybe the next time we can post the recipe! 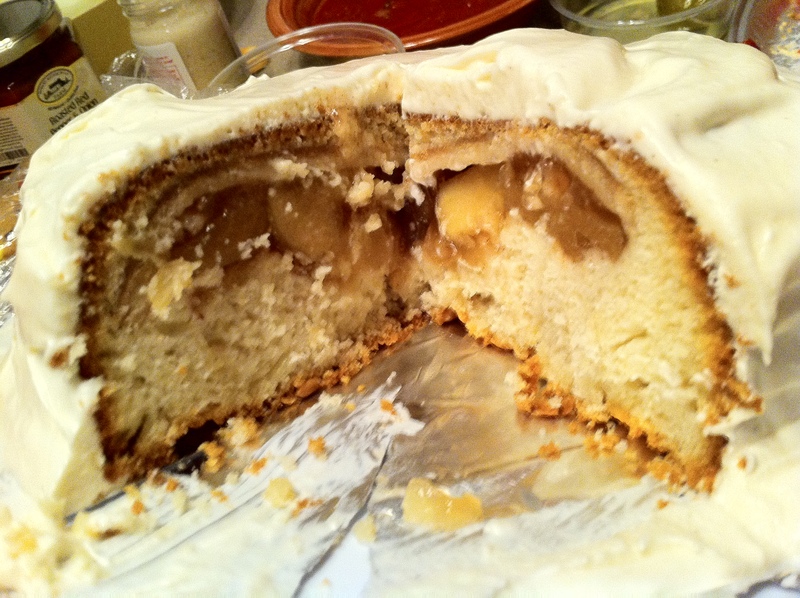 Posted on April 4, 2011, in fancy food, home cooking and tagged apple pie, cake, pie in a cake. Bookmark the permalink. 2 Comments. That needs a clever name like a turducken or Brangelina.